Hubby and I recently spent a week house-sitting for my in-laws. They casually mentioned that they might not be able to go on a vacation because they couldn’t find a house-sitter, so Hubby and I volunteered, even though their place (with two dogs, three kitties + a woodworking shop set on 80 acres of aggressively pollinating trees) always gives me massive allergy attacks. My desire for free rein in my father-in-law’s amazing woodworking shop overruled any health concerns (plus it would have been so sad if they’d had to forgo their trip!). Handy Hubby and I knocked out four easy woodworking projects while we were there. Being surrounded by scrap wood really sparked my creativity! I tried to convince her of the merits of a trendy painted edge. She collects pink and yellow Pyrex and has pretty grey and pink patterned dishes, so I almost had her convinced that a pale pink accent would be perfect but, alas, she nixed the idea in favor of plain wood. Plain! But she did suggest that we attach little legs to give it some flair. 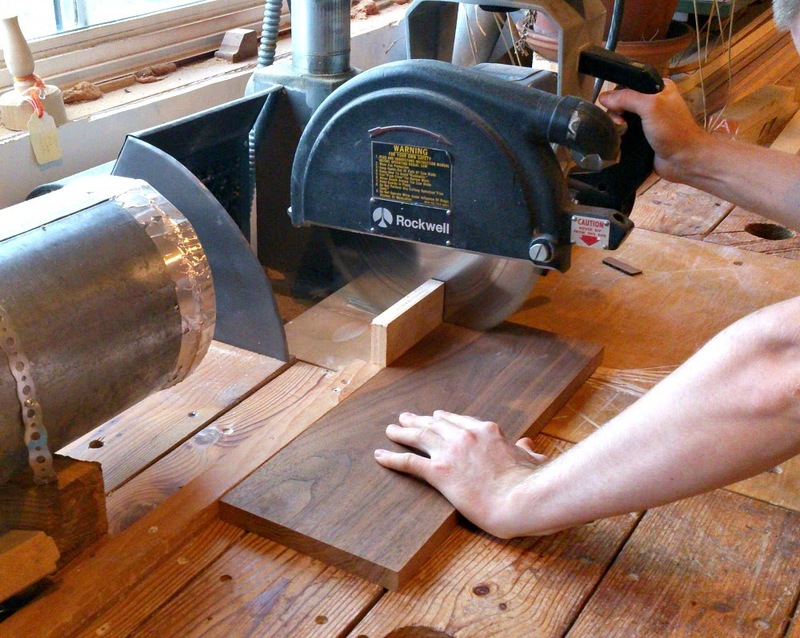 With our instructions delivered, Hubs and I got to work making a modern, solid wood trivet on legs. First we trimmed the edges, because one was rough from the mill, using a radial arm saw (a table saw or circular saw would do the job too). 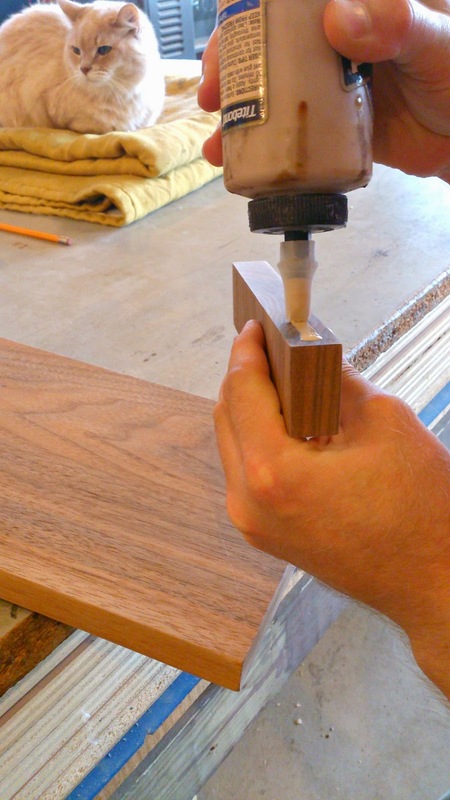 If you’re using a rougher piece of lumber, you might need to add planing – or at least running the belt sander along it – to your list of steps. Lucky for us, this piece was already planed. Next we cut off two identical strips, each about 1 1/2 inches wide. With these pieces removed, it was the length Mom requested. After that came a lot of hand sanding. Hubby suggested using a router to soften the edges, but I like the blocky look. Instead, I logged a little extra time with the sandpaper to soften the edges. 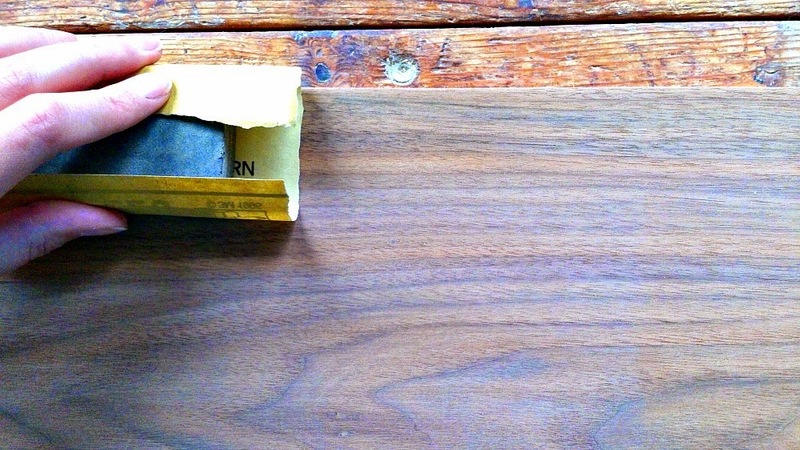 I used a sanding block and started with 120 grit sandpaper before switching to 220. Here’s a great article on how to properly switch grits. Basically, I just wanted it smooth to the touch. When the sanding was done, we wiped down the pieces and affixed the legs with waterproof wood glue, just in case it ever gets too vigorous a washing (although this really shouldn’t be submerged in water). We opted to skip screws/nails because this isn’t a high-stress pieces so the glue will offer a sufficient hold and a cleaner look. Once the glue was dry, it just needed a finish. 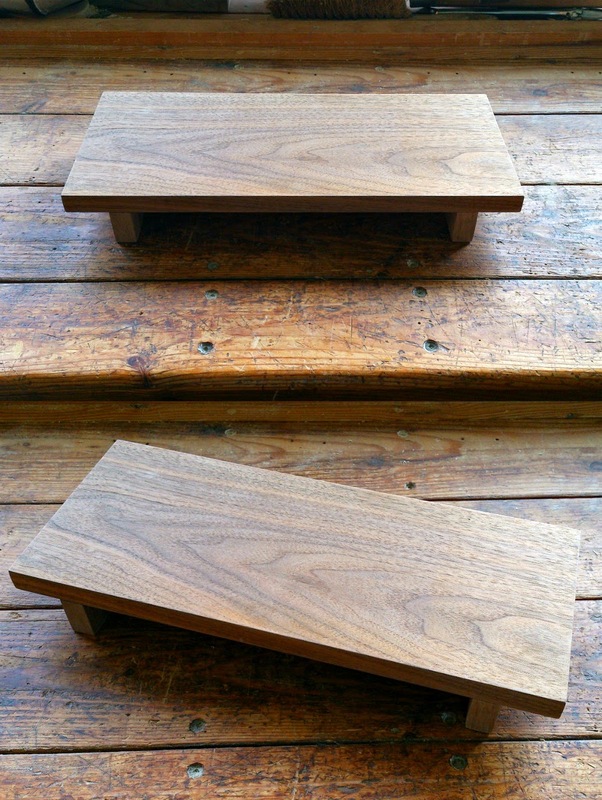 I applied a few coats of teak oil. 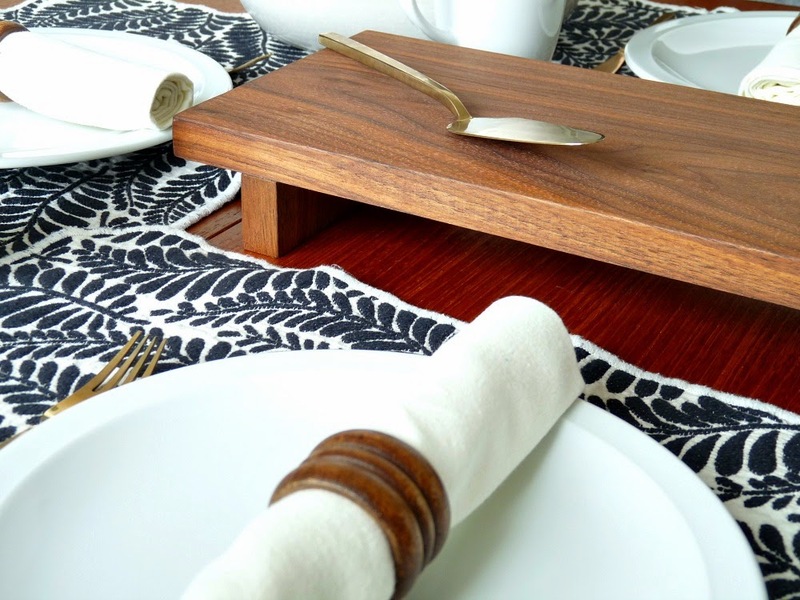 Applying eak oil is so simple (catch my teak oil tutorial by clicking here): apply with a cloth, let it soak in (manufacturer’s suggestions will vary from a few minutes to a few hours), and then wipe off the excess. 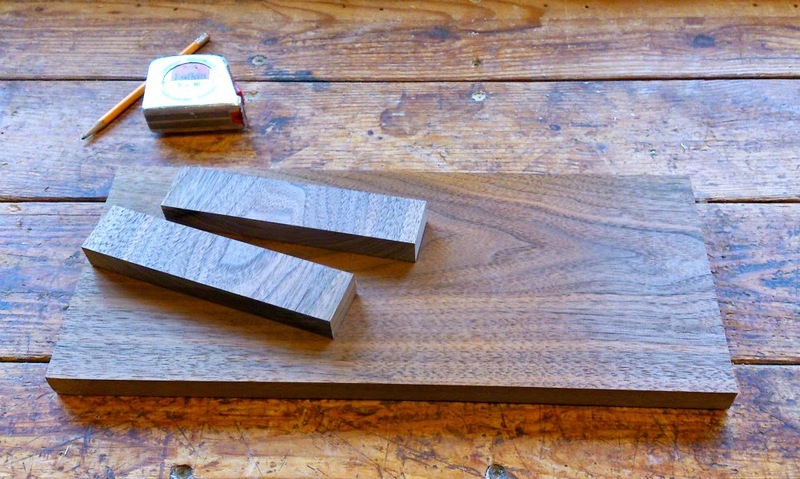 Food safe Danish oil would also be a good option, and then it could double as a cutting board. 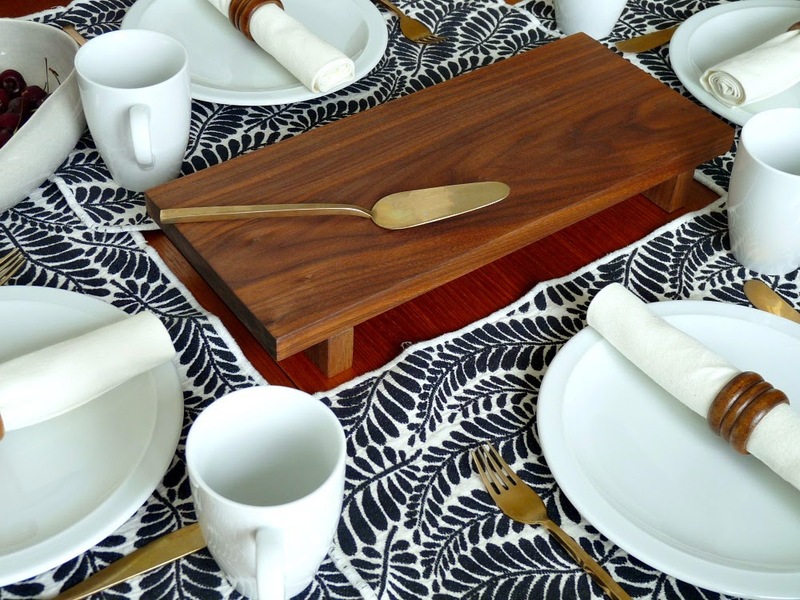 I’m getting really hooked on oiling wood – remember the Danish teak tray I revived? Oh, and the arms for the velvet garbage chair? They still look incredible. 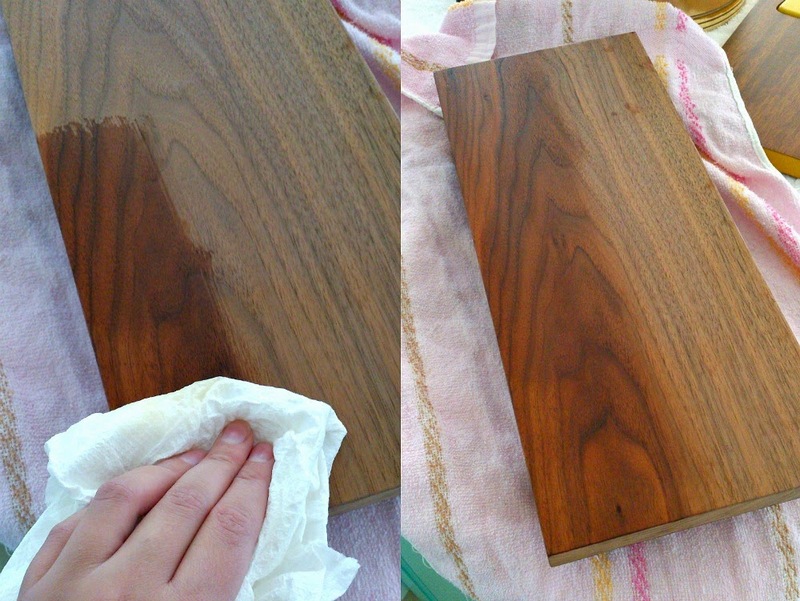 Oiling wood is such an easy way to bring out its natural beauty. 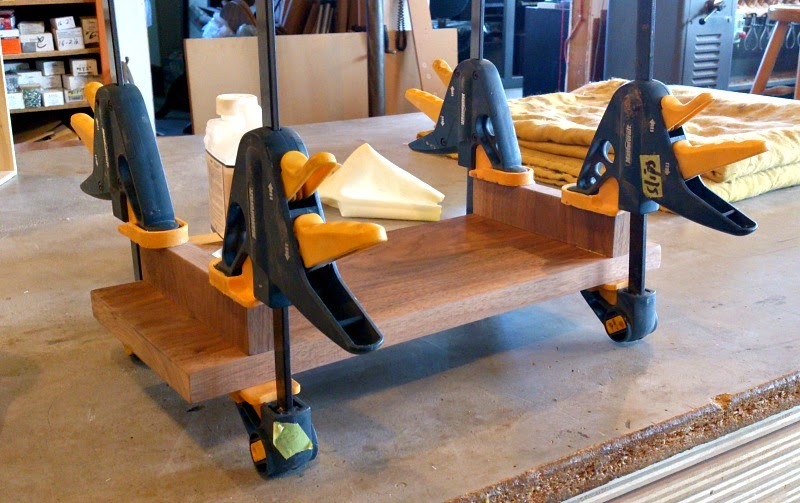 This was such a fun and simple project – a perfect beginner woodworking project! Plus you can make one of these cute trivets with any scrap wood lying around after another DIY. I still think it could use some pink…or turquoise! Oh Tanya,I swear we are kindred spirits. Sure enough, I am telecommuting today from and sneezing as I house sit two dogs and one cat. (I'm excited to get a non-shedding Komondor down the road, I am COVERED in golden retriever hair!) Love the tray, it's really darling. I am loving wood projects, staining wood is so fun now I'm scouring the house for things to stain and paint. Just the other day I said to my hubby, "Wouldn't that little antique table look amazing black?…" Can't.stop.myself.Also, our super dated kitchen has orange cabinets in great condition but dated appearance. I always think we should live with them until we can afford a renovation years down the road (get away induction stovetop! ), but it's actually HUBBY who keeps bringing up the idea of painting them (pitter-patter goes my heart). I do love a good painting project, but honestly, is it just too exhausting?? We are in a townhosue, no garage or good place to paint with a sprayer 🙁 What do you think? Sadly, although Komondors are low-shed, Szuka does set off my allergies and I have to take a daily allergy pill. But she is certainly better for my allergies than most breeds.I love black stain!! I think that little antique table WOULD look amazing black :)I think the work involved in painting/staining kitchen cabinets depends on the size of the kitchen and type of product used. If your kitchen is moderately sized, it won't kill you. It's not the quickest project, but it's certainly not difficult. The trickiest part is finding a spot to put the door fronts while you paint them. Dry time between coats eats a lot of the time this projects takes. Even with a garage, I've laid down tarps and painted a lot of projects in the dining room! So I don't think a townhouse is an impediment (but your furry friends might be – can you keep them away while you paint?) I think being motivated to do a project makes it go a lot faster, so if you're on the fence you might feel it's tedious. But with two sets of hands (it sounds like Hubby is game), it should be a lot easier. I will say that refinished cabinetry goes a long way toward updating a space. If your reno is a few years away, it might be worth it to give them a little spruce. Plus, it could give you a chance to try out the finish your dream kitchen might have. If you'd love a white kitchen down the road, paint the cabinets white to see how you'll like them. If you're thinking dark, then stain those orange suckers espresso. A spruce is a good way to figure out – for sure – what you love before you make a big commitment.For timing, try to tackle this project when you've got some time and no other projects/crazy commitments on the go. It will invariably take longer than you think. Thanks! At least now we know it's easy to whip up another one! Thanks, Staci! I've taken a new approach to blogging: I no longer post 5 times a week but have dropped down to 2-4 (usually settling in around 3) but I try to produce better content. Blogging less (and spending less time online in general) has freed me up to try new projects. I've been feeling so inspired lately. Beautiful work! I have to agree with your mom about leaving it plain. It's fantastic just as it is. Thanks Dana. I can understand why a lot of woodworkers don't like painted wood. 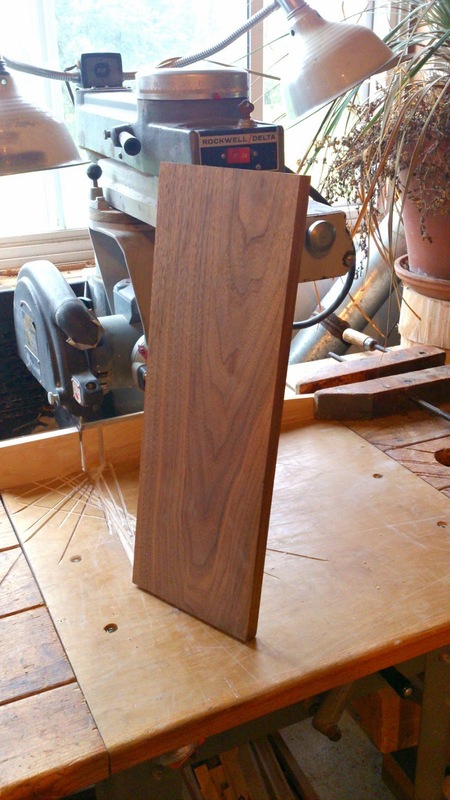 Being surrounded by wood in a rural woodworking shop gave me a new appreciation for wood grain. Teak reminds me so much of my dad who passed back in 2000. Back in the day we used to be in a van club. He had a van he converted from plain to the best camping van. It had a bed in the back (that was hydraulic and bent up to be a bench seat with storage underneath for camping gear), a sink, fridge and cabinets in the middle (when the door opened that was the first thing you'd see), parkay style floor, the engine surround with a little table on top with cup holders, and smaller cabinets up above the visors (for all his music tapes lol) and it was ALL teak and so nice. I have so many memories of it and him working on it. Anyways, enough of memory lane. This is very cute, I think a gold pinstripe around the edge would look nice and match the cutlery……but then I guess it might not match your mom's stuff and you'll want to keep it even more lol. I LOVE that you can use power tools better than most men. It's great too, that your dad taught you and was happy to have you hang around the workshop. That's really sweet! Ooooh! A wood shop, that would be fun. I need my own place (hubby is handy but he plays with metal and mechanics- whenever I grab a tool it's covered in greasy dirt. He tells me I get to have the garage when he's done building his workshop- which should be in a couple of months- yay! That little trivet is beautiful. I would love some lovely small scraps of wood to play with. 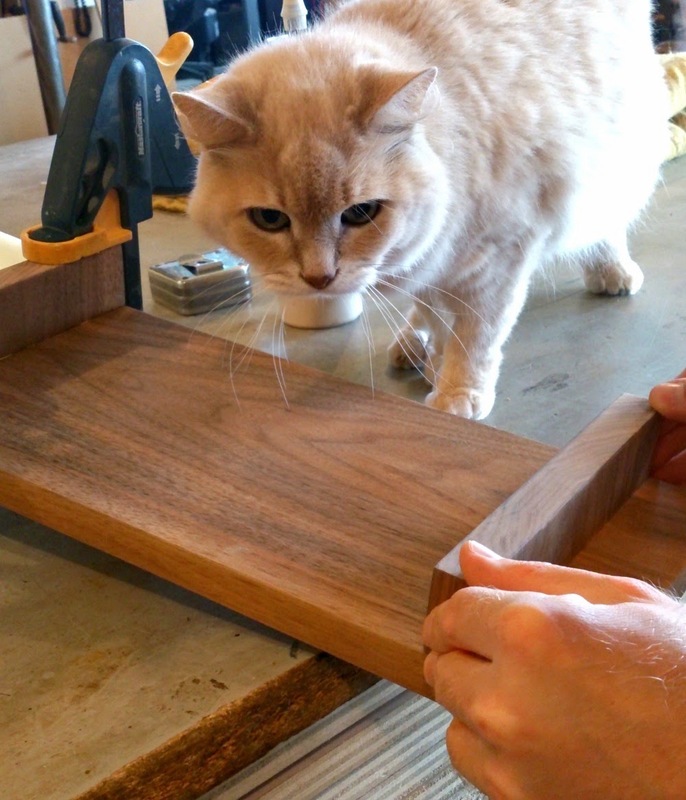 I have no interest in building furniture but give me scraps to play with, any day. That's exciting that his workshop is near completion!! Wow! But someone who can work with metal is just as exciting as someone who can work with wood – I have so many gorgeous welded furniture pieces pinned.I definitely logged some fun time in the wood scrap heap. And what a heap it was! Super cool center piece! 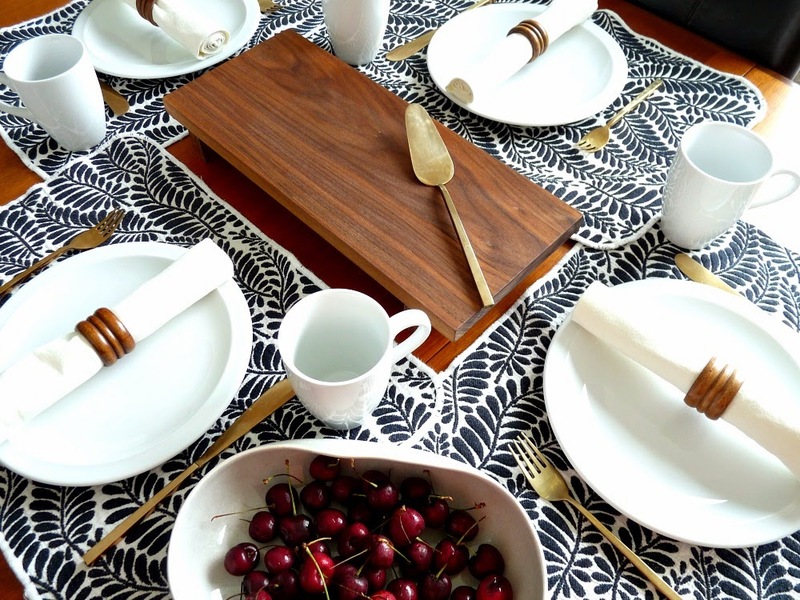 I love the table cloth as well and how the table is set with the whites and blacks. I think I will try this project myself and see how it turns out! Thanks! This would make sure a great gift and you could easily eek out a few from one 8ft length of wood. What a lovely trivet! I am sure your mom would have been very happy to receive such a thoughtful gift. I am new to your blog and loving my stay here. Merry Christmas to you! Stay in touch! !